I recently wrote about how I finally got an iphone and took the plunge of paying a monthly fee for cell service with Ting. I have really enjoyed having a cell phone the past few months and my bill hasn’t been over $15.00 a month!! Have you thought about giving cell service for Christmas? I was notified by Ting to let my readers know about this great special they are running until January 5th. I am so excited to pass along this deal to you. As you may know, if you pay an early termination fee in order to break your contract and come to Ting, they will give you credit for 25% of your ETF, up to $75 per device. To put that into perspective, the average bill for one device is $26, so that’s almost three months of free service! To up game, we’re increasing that to 50% until January 5, up to a max of $150 in credit. 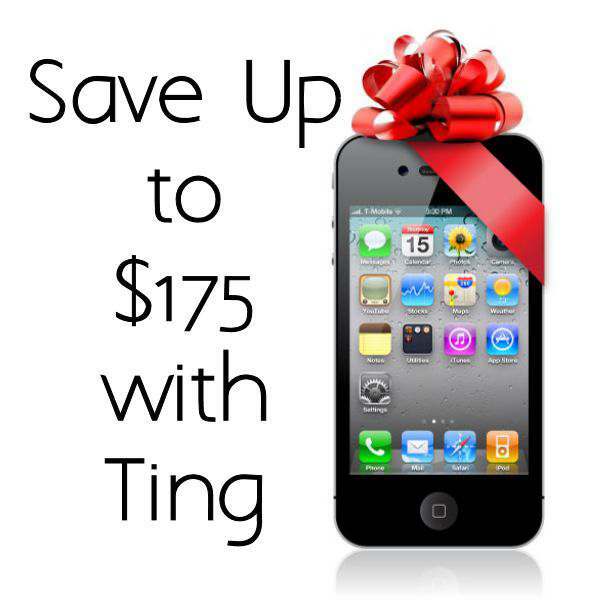 If you refer anyone to Ting you can also get the additional $25 in service credit. In total, that’s a max of $175 in credit! All you need to do is sign up with Ting by clicking on any link in this post or the ad at the bottom of this post or in the sidebar and once you are there provide your ETF details at ting.com/ETF. Not only will your cell phone bills go down but look at all the credit you will have to start with. Ting will be more than happy to help you with any questions you may have. Please be sure to read my other post on how you can buy your phones there for much less and other details on how this cell phone service works.